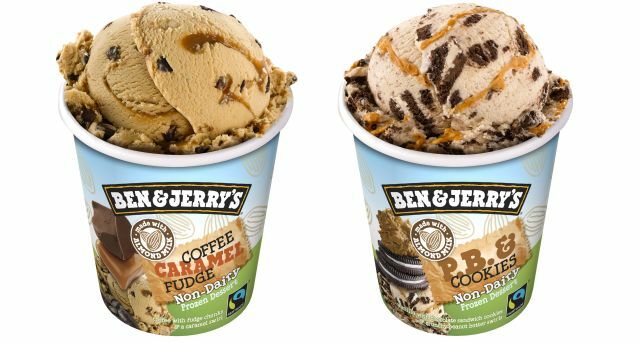 Ben & Jerry's now offers four new non-dairy, certified vegan flavors of frozen dessert (not ice cream because it's non-dairy and not frozen dairy dessert because, again, not dairy). - P.B. & Cookies -Vanilla frozen dessert with pieces of chocolate sandwich cookies and crunchy peanut butter swirls. - Coffee Caramel Fudge - Coffee frozen dessert with fudge chunks and caramel swirls. - Chocolate Fudge Brownie - Chocolate frozen dessert with pieces of fudge brownies. - Chunky Monkey - Banana frozen dessert with fudge chunks and walnuts. All four flavors are made with an almond milk base in place of milk. They're available in pints with a suggested retail price of $5.69. P.B. & Cookies can also be found in Ben & Jerry's Scoop Shops. 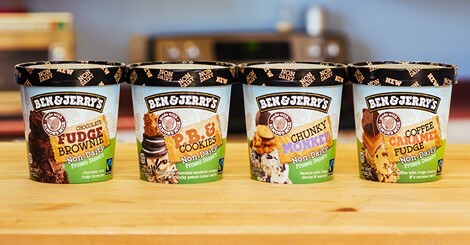 Photos via Ben & Jerry's.